Actress Kangana Ranaut's Manali bungalow has been one of the most-talked about celeb home for a while now. 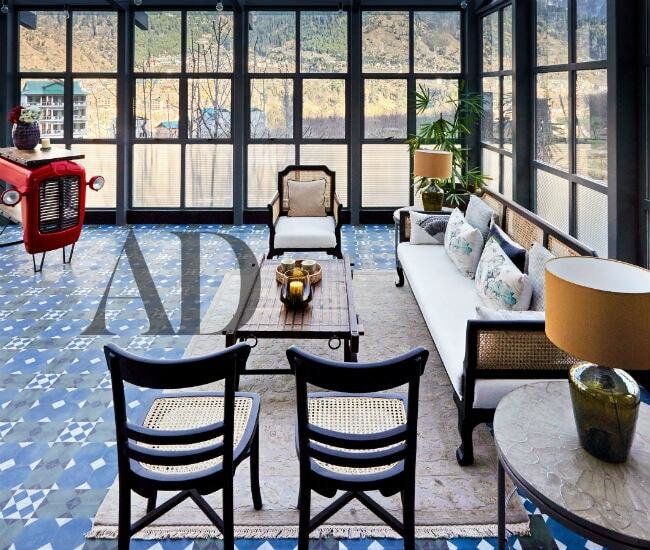 Kangana opened her doors to Architectural Digest India for the first glimpse into her Manali mansion for the magazine's May - June 2018 issue. She had initially planned a one bedroom house, ended up with a grand bungalow against the backdrop of a picturesque snow-capped mountain range of Manali. We finally have the first glimpse of the 30-year-old actress' home. "At the main entrance, Kangana Ranaut, dressed in Gucci and Dior loafers, stands against the charcoal grey facade with strips. The white windows with louvered shutters add to the old mountain home mix," as described by Architectural Digest. (Just lovely). "The house is huge, as you would expect it to be. But it's got that white-picket-fence charm," Architectural Digest describes her home. It was handed over to Kangana (with the interiors done) in November 2017. "I gave Shabnam (interior designer) carte blanche, except for the timber ceiling in the living room, which I took a picture of in New York, and sent to her. I trusted her with everything. Later in life, I imagine I'll have a clearer idea of my taste in interiors, but for now, I just wanted it finished while I was filming," says Kangana of the interiors that took nine months to install. We've curated some more picture of how Kangana Ranaut's Manali mansion looks like. (More details after you get a brief idea). Now, take a tour inside Kangana's home. (Click here to see other pictures). According to Architectural Digest, Kangana's master bedroom has a classical armchair, a Jaipur Rugs carpet. The wall sconce is a customized piece acquired from Mumbai's Chor Bazaar. The bedspread is from Ralph Lauren Home. The dining room has been designed like a foyer, the entrance passage has some of exquisite items placed at the right place and the guest bedroom has been designed by The Orange Lane. "I thought this would be a retreat but it's the ultimate party house," she told Architectural Digest, adding that her assistant delivers wine. "My mum prefers what she calls the 'Dubai style', with chandeliers and lots of glitz. She really wanted me to do at least one 'Dubai' room!" she said. That was how Kangana Ranaut's Manali mansion is like. Click here to take a tour. On her birthday (March 23), she had planted several trees in the garden of her bungalow. Kangana Ranaut is currently filming Manikarnika-The Queen of Jhansi and she has also signed up for Ekta Kapoor's Mental Hai Kya. She is all set to make her Cannes debut this year.